Sauerkraut and mushrooms are the perfect marriage in Polish pierogi, Polish naleśniki (also known as blintzes or crepes), and Polish uszka (known as "little ears"), Lithuanian koldunai, and kulebiak. Since these are meatless, they would be perfect for Lenten meals or for wigilia, also known as Christmas Eve supper, and fit for an ovo-lacto vegetarian. If you have any leftover filling, it freezes well. Note: while there are multiple steps to this recipe, this pierogi recipe is broken down into workable categories to help you better plan for preparation and cooking. In a medium saucepan, add the sauerkraut and cover it with water. Bring it to a boil, reduce the heat, and simmer for 20 minutes. Drain. In a large skillet, sauté onion in butter until golden. Add the mushrooms and sauté for 3 minutes. Stir in the sauerkraut, salt, and pepper. Sauté until the kraut turns golden, about 20 minutes. Remove the pan from the heat and let it cool. Add chopped hard-cooked egg (if using) and sour cream (you might need less sour cream if you don't use the egg or more sour cream if you do use the egg) and mix well. The consistency should be like a paste. You should be able to form it into a ball. In a large bowl, combine eggs, sour cream, oil, salt, and chicken broth until well mixed. Add flour and knead by hand or in a stand mixer until the dough is smooth. Wrap the dough with plastic and let it rest at least 10 minutes. Alternatively, you can put it in the refrigerator for several hours or overnight. If you are doing so, allow it to come to room temperature before rolling it out. Dust two sheets of parchment paper with flour. Roll the dough between the sheets of parchment paper to a 1/16-inch thickness. Using a 3-inch round cutter (or a glass with similar diameter), cut the dough into circles. Add a dollop of the filling to the center of a round, fold it over, and pinch the edges together. Place the filled dough circles on a parchment-lined baking sheet and cover the pierogi with plastic wrap while you continue to roll, cut and fill. Be sure to gather the dough scraps, roll them out, and use them to make rounds as well. At this point, you can freeze the pierogi if you don't want to cook them immediately. Bring a deep pot of salted water to a rolling boil. Reduce the heat to a simmer. Drop about 10 pierogi at a time into the water. Stir once so they don't stick to the bottom. When they rise to the surface, cook about 3 minutes. If your dough is thicker, you may want to cook it longer. Using a slotted spoon, remove the pierogi to a buttered platter. You don't want to transfer them to a colander as they will stick and tear. Repeat until all of the pierogi are cooked. 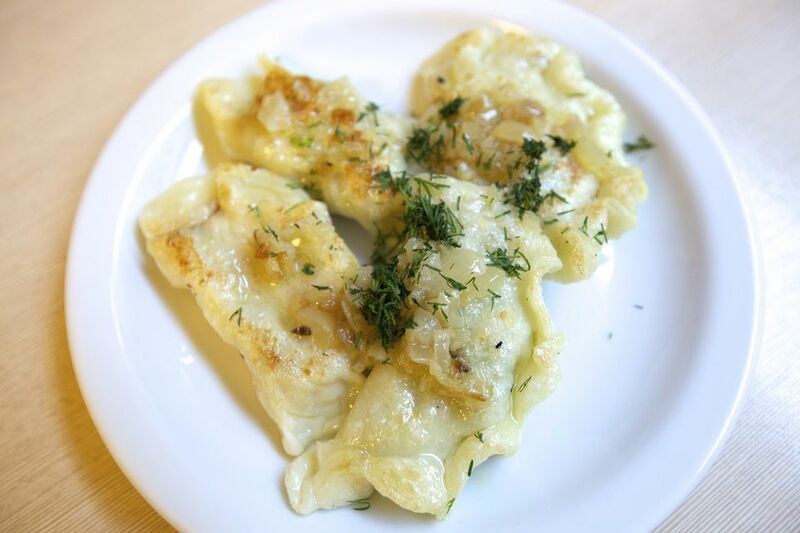 Serve the pierogi with melted butter or sour cream and enjoy! You can freeze the pierogies before cooking if you want to make them ahead. Place the parchment-lined cookie sheet in the freezer. Once they are frozen, you can transfer them to a freezer bag. They can be stored for up to three months before you boil or fry them. Boil frozen pierogies until they rise to the surface, about 8 minutes. You may enjoy pan-fried pierogies. Have the skillet ready as you are boiling the pierogies. You can use butter or a combination of butter and olive oil for frying. Pat the pierogies dry as you remove them from the water and transfer them to the frying pan. Fry approximately 4 minutes on each side until crispy.